ONE: To create the “strawberries” for our pie, make a deep pink color with 8 oz white m&p soap base and the non-bleeding red color. 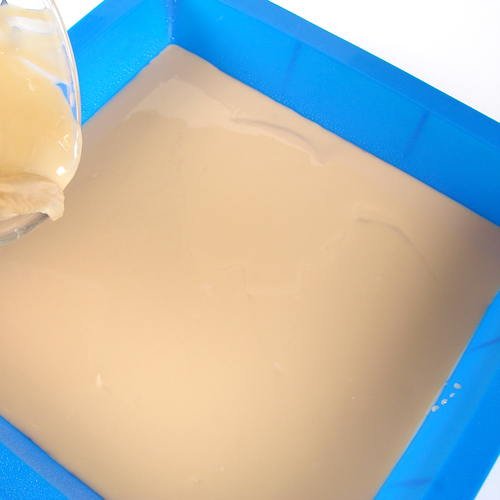 Mix well and pour the soap into the silicone tray mold. Once the soap is set-up, remove from the mold and cut the soap into small, irregular chunks with the crinkle cutter. 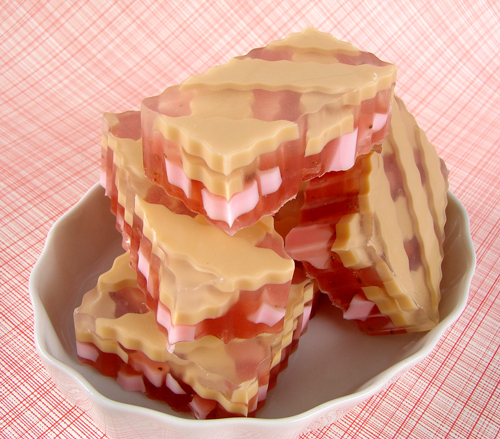 Set the pink soap chunks aside for use later. TWO: Now it’s time to make our “pie crust”. For a warm toasty crust color, melt 8 oz. 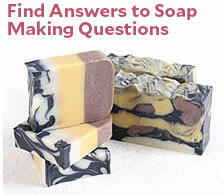 white m&p soap base and mix in 6 to 8 drops liquid yellow oxide, and 2 to 3 drops liquid brown oxide. 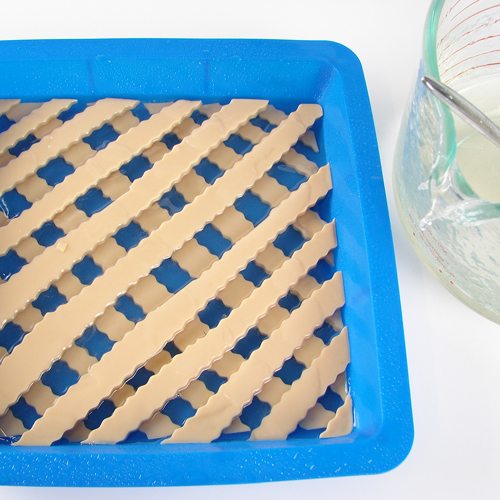 Mix well and pour the soap into the silicone tray mold. Let cool and remove the soap from the tray mold. 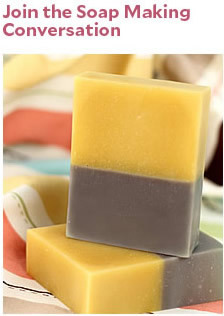 Use your crinkle cutter to cut the soap into diagonal strips and set aside. 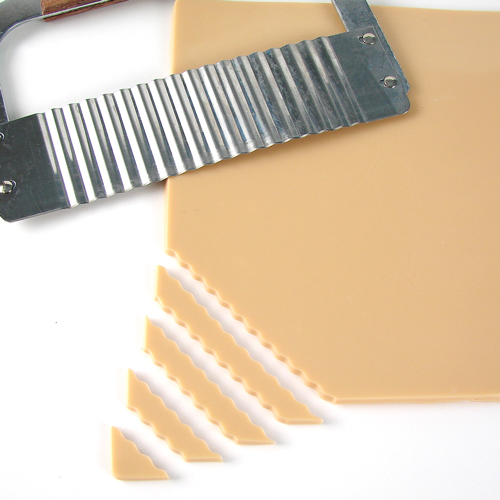 THREE: Before we start embedding, lay out your strips (on a clean cutting surface) in a criss cross lattice pattern. This is is how we’re going to embed them in the soap. FOUR: Melt 16 ounces clear m&p soap and cool to 120 degrees. Pour a shallow layer into the brownie pan and work quickly to layer in your first layer of toasty strips, being sure to spray frequently with rubbing alcohol. Pour another thin layer of clear soap and add the rest of your strips in the opposite direction, making a criss-cross pattern. You only end up using about 4 ounces of the soap. FIVE: With your remaining 12 ounces of clear soap add Merlot Mica and Strawberry Seeds. Mix well then scent with a blend of Strawberry and Almond Biscotti fragrance (we used 4 parts Strawberry and 1 part Almond Biscotti but get creative and use any ratio that you want). SIX: Spray the lattice with rubbing alcohol and pour half of your Strawberry soap. 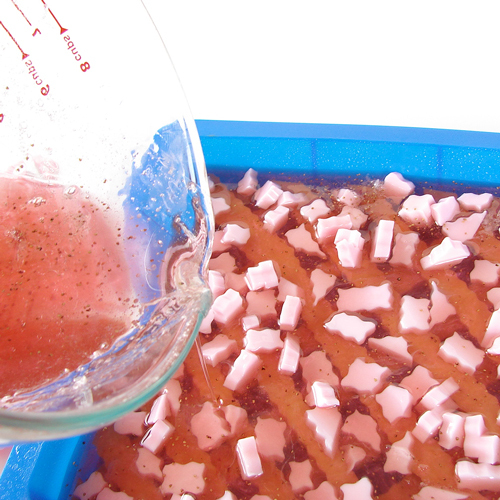 Then generously sprinkle your pink soap chunks in (spraying everything furiously with rubbing alcohol). Then pour the remaining strawberry soap over the top. It’s o.k. if a few pieces are sticking out. 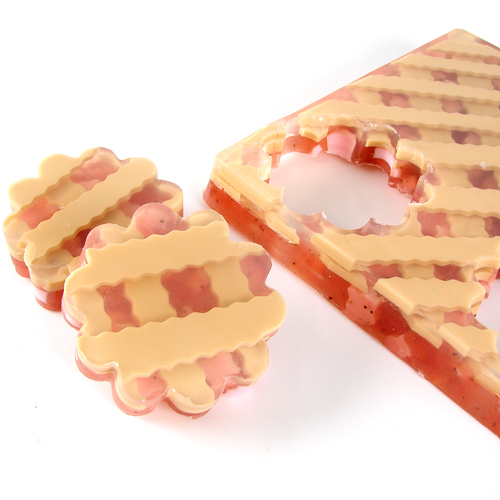 SEVEN: Once your soap is completely set-up, pop out of the mold and cut into little pieces with the daisy cutter. Or use your crinkle cutter to cut into rectangles like the picture at the top. Hurrah! Cute soap!